* A powerful remedy from the Sunnah. * Learn the benefits and techniques of Hijama Therapy. 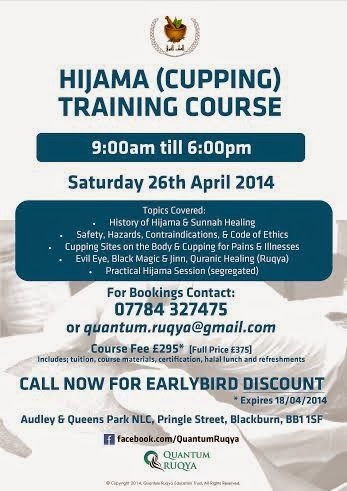 * Qualify as a Certified Hijama Practitioner (CHP) upon successful completion. * Excellent for those interested in holistic health. Fee: £295* (full price £375) includes tuition, course materials, certification, halal lunch and refreshments. Course is for Brothers and Sisters, with completely separate rooms for practical session. Invite a friend to the afternoon practical session to perform Hijama on them.